Ett inte alltför välbesökt seminarium höll jag, Annika Lidne och Björn Falkevik igår. Slides och länkar till bambusingar finns här. This entry was posted in Events, Social net/media on 2008 05 31 by Niclas (admin Researcher). Föreläsning av HCO och Lidne Inc.
Jag, Annika Lidne och Björn Falkevik håller en föreläsning tillsammans på Högskolan Dalarna idag. Följ den via Sthlm Social Media Club och Bambuser. Var med och tyck. This entry was posted in Events on 2008 05 30 by Niclas (admin Researcher). What is web 2.0? Second coming of the term. En video som förklarar web 2.0 – connecting people. Discussion about the term. It’s a complicated topic, it represents a challenge to many IT-people. The IT-people is the key to get org’s to implement social media. If someone alienates IT-people it will not be upgrading 2.0. The era of social computing. The social structure in which technology puts power in the hands of individuals and communities instead of institutions. The mobile is probably the most important device in the future. It is about to change the behaviors of people. The mobility is to a mindset-shift: everywhere is the workplace. The mindset is changing the behaviors. The digital natives is clashing with the digital immigrants. The communication change: young – SMS, Twitter; older – email (and phone). Evolution – from read-only to read/write and sharing/giving. New companies, new ideas, new behaviors appearing to leverage the shifts. If the phone is on; it’s okay. Twitteriffics free version use advertising, relevant out of the using target group. The new trends in software dev. is on usage not on the sell pitch. The CTR-concept is probably changing to easier ways to market. Critical Rules of engagement (engagement is one of the most over-used buzzword). The newspapers aren’t dead. The free editions is growing. Looking on the statistics (old) that some of the big blogs have the large reader-bases, compared to ordinary media. Trust in businesses are higher than gov’s in 14 of 18 countries. US divide is largest divides. Mainstream media are the most widely used sources of info about companies. “Person like yourself” and experts continue to represent the most credible spokespeople. The social customer manifesto. The reflection of the consumer. I don’t want to do business with idiots. They pay attention to (and are influenced by) word of mouth. Annika disses TV4s nya Nyhetskanalen. Talking about the RSS-feeds blow out. People scans their RSS. The headlines is important since it’s the thing that you read. An example: a guy do a podcast about his hood in London. Not a lot that are subscribing but he do it since he can. BBC are going to offering user generated movies. A discussion of the intellectual properties thing. There will always be some technological securitythings on the intellectual property, the Utopia of non-DRM. Björn is not to sure. Telling about Rob Zombies test on the net. The Facebook Fatigue. Putting up a lot of the platforms. Discussion on the geo-tagging/personal integrity. The UK CCTV-thing. Are we loosing privacy since we are trying too much to hide our private things. A lot of the “problems” of harassement might be the perception of it. The individual have the choice on what to go online with. The problem can be to much closure – and it starts the fear on what to disclosure. If you can do it on the real world – you can do it on the net. Some cases. Chevrolet Tahoemashup. When it started they started to engage and make dialogue with the critics. Everyone participating in the the online conversation and the GM is pretty much win. But the thing is – everyone can take every content and do what they want with it. The old answer would have been to send cease or desist-letter. The new is to engage and connect. Social media space: 1,3 million blog posts daily (18 per second), 100k new blogs daily (2 per second). But a lot is spam blogs. More podcasts than global radio stations. Feedburner delivers 44k feeds. And of course Myspace 100 mil, 64 mil at Facebook and LinkedIn about 9 mil. The consumer maybe in control. Jeff Jarvis role in Dell Hell as an example. They started One2One. Dell managed to turn it to a good outcome. Become an opinionplace, and works as a idea factory. Other topics except from the supportdiscussion. The Dell Ideastorm is even more progressive. The discussion on what to get back on the users engagement. The sharing/giving is one thing of the mindsetchange. The disruption on the push-model of information might seem like a model of chaos. But it is a reversed push-model and mixed with reciprocal pulls. The page view-thing is RIP. The thinking is still on the quantity rather than the quality of the readers. 31% state that blog has generated significant biz ops. 66% believe blogs becoming more influential as info source. Use the tools to find the right people to get in contact and get on. Who is the keybloggers? Who is the hubs of their segment of the blogsphere? Hobson have built a blogdatabase on different segments. To approach a blogger isn’t the same that approaching the journalist. The blogger is interested in his or hers personal (blog) brand when journalists are interested in the public and the objectivity. If you’re not prepared – don’t ask people to write about it. And do not try the NDA-track. Talk about the conditions for being publiced at bloggers. The best way is to disclose what it is all about. The discussion of objectiviness and trusthworthiness. To Neville means it’s the core of social media – through the transparency and disclosure. Maybe it is more important for the company to be a stealthmarketeer more than the trustworthiness of the blogger. Neville believes it is the other way around. He sees the disclosure in the old media as a new tendency. The Deloitte Film Festival employment brandingjob. From internal to external – the brand marketing. Exempelvis Green Dot. An example; creativity, the available tools and the incentives (competition, motivational, award and stuff). Next is about using content. Creative commons, social media news releases and social media newsroom. CC need to get real test-cases. Neville is looking at Electrolux Social Media Newsroom. It’s basic but using the social mediathingys as tags and links to external things, and links to where the name is mentioned on the blogs. 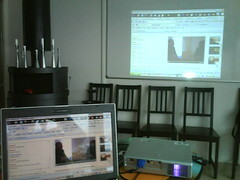 And RSS-feeds, bloglinks and the images on the flickr and the videos at Youtube. They too have the social bookmarking-share. The easier you let people understand your company and how to use the content, the more they will. The good thing of the social media press release is that it is not one single definition yet. They missed the target group in the way to use the content. Should one have comments to a press release? Is that a conversation piece? Not in the traditional writing way. Neville Hobson thinks that the traditional press release is still needed for the old wires and Google juice. The wires aren’t up to the social media press releases yet. GM Europe Social Media News Room. Using commentaries on the press releases and all the downloads of the GM. They using a blogroll with a lot of external blogs in the segment across Europe. Sharing links and a choice of print version. They also got related entries. The social media press release from Ford Focus. Everything is not yet fab anywhere, since the standard isn’t yet set. Leverage is with he who seizes the conversation, not the one who starts it or tries to control it. GMblog – using the Twitterbadge. The communicator’s role: counsellor, adviser or guide – on communication not by blogging. Hands-off role – no anonymous ghost writing for the CEO. There is a massive difference between writing a speech or writing a personal posting on a blog. A leader should use about 30 % on communication. objective: transparent, candid and timely communication. Results: 4 mil page views/week. Expanding in languages and areas of Dell business. About 100-200 comments/day. objective: encourage ideas, feedback, input and dialogue. Result. 8k ideas generated, one mil unique users. 50k comments. 1500 comments/day. Avoiding the credibility deficit. Listen actively, understand that social media tools enable real conversations and empower customers. When negative issues arise, deal with them head-on. Know that look, but don’t touch is not a successful strategy. Enter the conversation. Engaging the right way. Think like a customer (again), never underestimate the value of a sincere “I’m sorry” or a “thank you” with no strings attached. Remember that real conversations are two-way. Don’t try to bury the negatives. Answer the tough questions, and do so with honesty and transparency. Why does it matter? Real conversations build real customer relationships. Social media tools help establish credibility and trust on a different level. Engaging directly will become an increasingly important competitive advantage. It’s not about numbers. It’s about the right people. Approaches: DIY, consultant, agency, subscribe on monitoring service, contract a service. What? References: your organization, products and service, key issues. Who use you social media props.? Connections to you? Are they talking about you? Case issues. 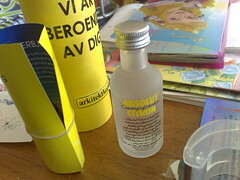 Absolut Vodka. Some of us thought it was… fun… First the Google stuff. Clean search, news search and blog search. Then Technorati, which is rather flaky. Blogpulse. Tweetscan. Measuring ROI. Return the question: how do you measure the ROI on an employee newsletter. Second Life. It’s a first step on the way to the 3D-Internet. Interesting playground. The IBM-case. All is experimental. Why? Because it is possible. Because it is fun. Because it is something else. Social media is not the cure for cancer, but there is useful tools of communication. Everything is interlocking. This entry was posted in Disruptive Media on 2008 04 17 by Niclas (admin Researcher). På Berns pågår Disruptive Media. Där skulle jag ha varit om inte en riktigt elak förkylning satt P för det. Känns inte speciellt kul. Däremot kan man följa det via diverse livebloggande (Sofia livebloggar på SSBD), livebambusande och följa jaikubackchannel. Själv ska jag bädda ner mig för att försöka ta griståget imorgon bitti och vara med på Neville Hobsons workshop. This entry was posted in Disruptive Media on 2008 04 16 by Niclas (admin Researcher). Jag gillar Arkitektkopia. Fr a hittade jag igår en spännande person som jobbar på “vårt” kontor som helt klart är inne på att jobba integrerat och på ett smart sätt med variabeldata. This entry was posted in Gyllene Hästen, Legal&Ethics, Perm&DM on 2008 04 05 by Niclas (admin Researcher). Gyllene Hästar gick till Ejendahls i B2B, byrå Ehrenstråhle, till Idre Fjäll och byrå Spenat, och till Region Dalarna och byrån Bangalore (enda dalabyrån som vann). En intressant utveckling. Det visar att det inte längre finns en regional bransch som använder varandra – företagen jobbar med byråer oavsett var de ligger. Vilket bör få oss byråer att jobba på ett nytt sätt – att inte stirra oss blinda på regionen och de företagen utan arbeta utifrån vad vi kan göra för varje företag. Dalarna behövs nog också. Man kan inte alltid göra rätt. Jag tror det vore bra om man också vågade göra fel ibland. This entry was posted in Gyllene Hästen, The biz on 2008 04 05 by Niclas (admin Researcher). …men en så trevlig fest kan till och med få mig att glömma bort det här med mobilbloggande. Simon stod bättre under intervjun med Anna Romson och utdelningen av B2C och O2C. Liksom schysst tagning av en av magiuppvisningarna. Man sitter lite illa… Ser inte magiuppträdandet. Får man gå och röka istället? This entry was posted in Gyllene Hästen on 2008 04 04 by Niclas (admin Researcher). Och självklart kommer jag att liverapportera så mycket som möjligt. Dels kommer jag att mobilblogga här på Researcher, dels kommer både jag och SB Media att bambusa tillställningen: min kanal, SB Medias kanal, liksom att bilderna jag tar kommer ligga på min Flickr ASAP. Jag gissar att jag också kommer att använda “lifestreamen” Jaiku. This entry was posted in Awards, Events, Gyllene Hästen, Persona, The biz on 2008 04 04 by Niclas (admin Researcher). Men det är jag som bloggar. Dags för Guldägget. Researchers inbäddade reporter sitter på plats med sin mobiltelefon (hon har väl tänkt sig ta med några ägg hem också). För kampanjerna se nomineringarna. Först ut. Guldäggsplaketten: Alkoholkommitén och Le Bureau. Stay tuned. Uppdaterar postningen under kvällen. Instant kommer det dyka upp i mitt jaikuflöde. DR: Guld till Ester för Forum, bokförlaget. Kul! Goss fick silver för Göteborgs Räddningsmission. Grattis! Print: Guld till DDB för McDonald’s Sill och nubbe-kampanjen. Media: Guld till King för Ving (tack Björn Mellstrand…). Radio: Guld till Alkoholkommitén och Le Bureau. Internet: Guld till Farfar och Diesel Heidies 15 mb of fame. Som också tog ett silver för Björn Borg-kampanjen. Antar att Matias är nöjd. PR. Max hamburgare vann PR-priset. Faktiskt enda PR-byrån som var nominerade: GCI Stockholm. Läs hur juryns ordförande tänker runt det faktum att PR-priset hade flest reklambyråer som nominerade. Utomhus: Guld till McDonald’s Servetthållare, byrå DDB Stockholm (storslam i år?). Priset utdelat av Leon Nordin. Bara en sån sak. Falken tog en snabb visit på Guldägget och bambusar såklart. Guldskrift vanns av Berghs School of Communication. Reklamfilm: Oddset The Stick. Byrå WatersWidgrenTBWA. Silver till SAABs Release Me. Design: Guldägg till Stockholm International Jazz & Blues Festival av Garbergs. Slutligen. Integrerad reklam: Försvarsmaktens rekryteringskampanj gjord av DDB Stockholm. Man kan se att DDB Stockholm gjorde storslam. Och knappast var det speciellt oväntade vinster. Kreativt? Jag vet inte. Att F&B uppenbarligen inte fallit jurysarna på läppen är ett faktum. Stort tack till Ulrika Good från Goss som hållit mig a jour. Uppdatering: Bloggen Veckans Rester har åsikter om pristagarna. Resumé gör en lång intervju med “Laxen” och en historisk exposé för DDB Stockholms liv. Dagens Media kör webbfilm. Nome Anders Norman från Remotion Design ger Guldägget en dagssedel utifrån att effekten av reklam inte bedöms. Jag tycker han är snett ute. Jag tror att det behövs en tävling i kreativ reklam. Som inte bedöms utifrån nödvändig effekt utan snarare kan vara en inspiration till att ta några ytterligare kliv i att göra något bra. För att återkoppla till postningen om Jonassons åsikter så är Nome en sån person som faktiskt skrämmer byråer att bara göra saker by the book. För effekt är alltid en benchmarking efteråt: när du ska göra något nytt så får man lov att använda tidigare kampanjers effektmätningar. Problemet är helt enkelt att om du har en unik idé med en nyskapande kreativ höjd så har du ingen effektmätning att benchmarka mot: det som aldrig gjorts kan inte benchmarkas. Istället blir det att man väljer en fegare väg, eftersom den kan bevisas genom effektmätning. Det är en imploderande strategi – allt kommer bli mer likriktad, mindre intressant och utvecklingen av det kreativa uttrycket sker inte. Att försöka få Guldägget till att även låta effekten bli en del av bedömningskriterierna gör också att tävlingarna blir mer likriktade: effekt prisas redan i 100Wattaren. Det känns som usel kritik helt enkelt. Lite raljant researchad med enkla Googleslagningar. finalen mellan Waters Widgren TBWA och F&B, och Forsman tog hem vinsten. – Skulle inte vilja säga att de vann, det var så att vi vann alla matcher utom den sista, sade Calle Dalin på Waters Widgren. Uppdatering: Ulrika hade med sig kameran. This entry was posted in Awards, Events on 2008 04 03 by Niclas (admin Researcher). … total bambusing-frenzy på Mobilkompostgalan. Plan Sveriges officiella (som Falken kör) med massor av intervjuer. Adam Tensta livesänder sin konsert från galan. This entry was posted in Events on 2008 04 03 by Niclas (admin Researcher). Everything will be social media. And it is happening right now. The consolidation of blogging and of the communitybased social media is now. The fact that media for the moment is trying to understand how to re-act on this disruptive landscape and the statistics showing that the big eruption of new user on Facebook and Myspace is over is proof that the social media is getting into it’s adolescence. Corporate blogging, interaction between the web and the mobile. It’s not the future. It’s a now. So what is around the corner? V-logging: the true democratization of the social media. Everyone can have their say. Even if you’re not the writing kind of person. And it is on the verge to be truly social with the mobile versions and the reciprocality when streaming live. As Bambuser. More social than media. Look at the utilization of Jaiku for the past months, or Twitter. Look at the bambusingfrenzy that aren’t just to show off but eagerness to be social. In an non-anonymous way that wasn’t there for say six months ago. Sidewinder: the death of nicknames. We want to be IRL, be ourselves even in our digital life. The lifestream. It’s already here but how many do really use it even among us early adopters? Th next thing might be not trying to find out the new thing that specifies in a web 2.0 app or service but giving away the nothingness. A simple handler of digital footprints, a mashup without nothing more to do than to let people collect their lifestream and let everyone or the ones of the user’s choice follow it? Yes, I said simple. To handle. Tagging everything, tagging is everything. Everything must be tagged. User defined tagged content will make the cloud complete since it’s not only the facts of the contence that are searchable but the understanding of the content – the user-defined tags – that do give another perspective on the content. Geotagging. I know what, I know when – now I want to know where. The possibilities both for the user and his contacts, but also empower the marketing relevance is bigger than the privacy issues. It have to be rather automatic. It have to be opt-in. Then it is the totalization of the social media – the user revolution. But here is my real thinker. The future thingy that is not an simple addition but something that again will rock the masses. To look at the future one have to look at the past. And take the human psychology and socio-psychology into the algorithm of futureness. I believe in the theory of digital immigrants vs the digital natives and the metaphor is important when understanding what to come. The digital immigrants aren’t general a age-defined group but probably would it (and the statistics of the net demographics verifies it) be most of us that are born into the early eighties that could be defined as digital immigrants. We have moved into the digital land and also have reminscence of when the internet wasn’t there. The negative immigrants have been forced against their will into it when some of us gladly did explore almost every aspect of it. And looking at the immigrationprocess in general the immigrant tend to a) search for their countrymen/likeminded b) be nomadic since their roots aren’t in this land. So both negative and positive digital immigrants are also more probable to move on. The life in this new environment is all about exploration and we become digital nomads. If we think that the other place is more fun, safe, supportive, social or if our social sphere has moved on – we do too. But the digital natives aren’t like us. They are born into this digital land. They aren’t interested in exploring new things just for the sake of exploring. They are digital settlers, they stay where they are and make it a home. It is not a mystery that Facebook seemed to attract a older bunch of people. The young already have their networks. And they will stay there until the critical mass of their networks is moving. Or then they are as homebound that they just start to build a new network in the same place. So even though many of you won’t believe it I think the next killer app of social media have to be in 3D, to be a virtual world. The natives are born and raised in the virtual reality of games. They have played everything. For them the gamepad is a more natural way to navigate than the mouse. For them the spatial reality is not only analog but as well digital. But it must be ease of use, open to API:s and to import (and export) your digital footprints and “the cloud”. The difference between the immigrant and the native is that the native can stay but want to build your world around you. If the place give the opportunities to grow old, to rebuild my place, renovate it and fill it with the things that is “me”. And the virtual world-concept puts you into a digital world that fulfill the basic needs of spatial understanding: we will ask for a room – not a plain two-dimensional hyperlinked page. A basic need of the human psyche. We want something that are our home – a sort of startpoint and something to come back to. And a place that you can grow older in, and in the meantime you build your network and your lifestream in the place that is your digital home. And the brands that you love will of course be a part of this – and pay for the juice. Of course with the mobile version to go with but yes – I still believe that we will use laptops in the future :). No. It’s not Second Life. To complicated and you get nothing for free. But the one that manage to make this app probably will be the next Zuckerberg. This entry was posted in Events, FBGarage, Social net/media on 2008 03 16 by Niclas (admin Researcher). Först. Jag har laddat upp ett gäng bilder från gårdagen här. Kolla in bambusingen också. Första delen (den långa) här och slutet på mitt anförande här. Jonny (aka Bambuser-Jonas) gjorde en lite mer bakom-scenen och mingelsväng. 1 (bland annat dissar Annika N95an :)), 2, 3, 4, 5 (MySpace-presentationen), 6 (fr a diskussionen efter Lidnes presentation där det hettade till), 7 (mingelmingel, bland annat intervju med Gitta och Mahesh). Thommie har gjort en del webcaminspelningar (bättre allt förutom att det är rätt stelt :)) från Facebook Garage: 1, 2, 3, 4 (mot slutet börjar min dragning), 5 (slutet av min dragning och frågestunden plus resten). Det man kan sluta sig till är att det fortfarande finns en stor osäkerhet i hur man ska kunna kapitalisera på sociala medier (och på öppenheten i olika nätverk). Och att det som nu måste diskuteras mer och mer är inte primärt teknik utan faktiskt arbeta med såväl nya som validerade affärsmodeller för att därmed kunna hitta vägar att låta det hela gå in i nästa fas: konsolidering av också de större nätverken inom social media-landskapet. Vidare behövs det helt klart en mer övergripande teoribildning även runt svenska användare och tjänster. Självklart är det inte någon skillnad på vilka teorier som är applicerbara generellt men när det gäller målgruppsanalys och liknande så krävs det mer än att lyssna på amerikanska tänkare. Liksom att vi måste bli bättre på att prata om hur sociala medier kan användas utifrån ett nyttoperspektiv: faktiskt var det egentligen ingen av oss som adresserade den frågan under Facebook Garage (nä, inte jag heller…). Det som nog slog en del av oss är att det faktiskt är lite synd att Facebook (eller Myspace) får allt ljus på sig. Visst – det är mycket stort men det är samtidigt stort på grund av att det fått mycket PR. Det finns så mycket mer inom de sociala mediernas värld som skulle kunna vara killers. Problemet är också att Myspace och Facebook skapat en animositet som också visar sig hos användarna. Självklart kan det i vissa fall tolkas som lovemarks, att användarna älskar och identifierar sig med “sitt” nätverk men i längden innebär det också en större inlåsning. Lite som kriget mellan mac och windowsanhängare. This entry was posted in FBGarage, Social net/media on 2008 03 15 by Niclas (admin Researcher). Kolla in livestreamarna på Bambuser.com. Först en sväng om Jonas Nyvall om Myspace. Vad är skillnaden mellan FC och Myspace: what you are vs what you dream of. The future: mer personlig, mer mobil (portabel) och mer kollaboration. Ett developer galleri har precis öppnat. Developer.Myspace.com. Tre olika API: open social, REST och Action Scripts. Den finansiella planen för utveckling: 100 % till utvecklarna. Regionalisering är intressant för Myspace. Min upplevelse är ändå att MySpace går till att bli mer lik Facebook? Intressant koll: jaikunördar har uppenbarligen nästan slutat att använda Facebook. Brit Stakston från JMW. Ger en bakgrund för både sin och faktiskt en sorts waybackmachine för att minnas att det inte är så länge sedan CD var grejen. Upplever sig som en guide för företag och guida dem genom och från sin skräck för sociala medier: internet är wild west with no moral, brist på kontroll och rädda för negativa kommentarer. Menar att Facebook har förändrat medvetenheten och insikten hos företag på ett positivt sätt. Men fortfarande är de kulturella skillnaderna stora mellan digital immigrants and digital natives fr a när det gäller transparens. Att många läser ex bloggar och liknande med mycket analoga värderingar och det innebär att det kraschar. Genom små steg och pushing the limits så kan man få företag att faktiskt bli mer transparenta. Allt handlar om flexibilitet och inte att det finns endast en lösning. Se möjligheten i att medierna är mer nischade än tidigare och hur man ska kunna använda det. Bringeusaffären kommer upp och utländska studenter är lite förvånade över att det hände i Sverige. Brit gillar inte att han gjorde en sån pudel. Annika Lidne. Förklarar att hon egentligen är rätt neutral när det gäller Facebook men förklarar ändå att hon ska prata om vad som inte är bra. Hon går tillbaka till Walled Garden och AOL som den första av dem. Walled Garden fungerar inte även för Facebook. Inte intressant vare sig när det gäller att inte kunna söka men också utifrån värderingarna. Ett antal problem: Scobles gräns för vänner, Beacon såväl som att inte kunna använda sina grejer utanför – problemet data portability. Och sen? Det är egentligen byggt för att vara en Fun Wall. Konversationen var inte tanken från början. Det som social media handlar om idag. Jämför Reklamförbundets grupp med exempelvis vissa diskussioner på Jaiku. Trend sensitivity innebär att bakslagen kommer fort. Det innebär att företagen som satsat på Facebook känner att de inte når den effekt som de tänkt. Trad. bannerreklam på Facebook är egentligen en dum idé eftersom folk är där på grund av andra saker. Social media går mot mer individualisering och individualiserade sociala medier som har en mer nishad användargrupp. För att välja ett media måste man kolla målgruppen väldigt noga. Annika menar att sociala medier är kvinnornas revolution på nätet. Bloggandet är kvinnornas. Registreringen av domäner görs mest av kvinnor idag. En i publiken undrar varför Annika hon bryr sig eftersom hon inte gillar Facebook. Annika påpekar att Facebook kunde vara bra. Om man inte gjort det man gjorde. Typ. Andie lyfter upp möjligheten att synkronisera mellan online och offline. Gabriel Sundqvist från Pronto om Rosa Bandet på Facebook. Ungefär samma snack som på Disruptive Media 07. Han får dock frågan om vad han hade velat gjort om det funnits en budget skulle han velat använt sina buzzare. Lite siffror: värdet närmare en mille, givande 500140 på 30 dagar. Peter Arvai från Mobispine, en nyhetsläsare. Har gjort en Facebookapplikation och vad de lärde sig av det. Pratar mycket om själva applikationen som de plockat in i Facebook. Problemet är bland annat de konstanta förändringarna i Facebooks API. Mobispine jobbar med göra mashups. Få installerar applikationer i sin mobiltelefon. Hur tjäna pengar på Facebook? David Haddad, Spontu. Riskkapitalister gick in och satsade pengar på utvecklare. Ett mikrolån ges till små utvecklare. Samtidigt är det knappast säkert. Få har kommit in i Facebook och kunnat visa effekt och framgång. Några har fått exempelvis iFamily, SocialMedia, Courses och Causes. Ger exempel på sånt som han tycker är bra. Sponsring är vettigt: exempelvis Superpoke, Zombies, Cities I’ve Visited. Jag pratade (kommer lägga ut dem senare). En riskkapitalist tog över och jag missade det hela. Men han förklarade att han kollade in stickiness. Björn Falkevik tog nya rekord att bambusa. Mahesh Kumar, en av FacebookSthlm Garage grundare, har livebloggat en del. Även Lotta H har skrivit en del. Den som livebloggat mest genomgående är Månhus. Tyvärr har han inte taggat dem så ni får kolla runt själva. This entry was posted in FBGarage on 2008 03 14 by Niclas (admin Researcher). På fredag ska jag sitta med i panelen på svenska versionen av Facebook Garage. Jag ska blicka framåt och gissningsvis tar jag lite plats om att prata om den mer övergripande bilden av sociala medier. Glöm inte heller våra kurser om sociala medier. This entry was posted in FBGarage, Personal stuff, Researcher, Social net/media on 2008 03 10 by Niclas (admin Researcher). Vad är den nya möjliga marknadsföringskanalen 1 to 1? Jag får försöka förklara bloggteori. Sen diskussion om kommentarer och nyhetsvärdering. Vad är den journalistiska produkten? Diskussion medieetik. En väldigt intensiv debatt. Nät vs. print, journalistik vs. journalism, traditionell media kontra internetmedia – traditionella journalister vs. citizen journalism. Fiskars målgruppssegmentering mot scrapbooking och handarbete: Fiskateers. Saxen som en självklar del. User-development inriktningen och user-generated material men på en egen kampanjsajt och hårt brandad. Man har lyckats att prata och bli intresserade av en orange sax. “Want power – give it away”. Ellis Island co-branded med Arrow. User-generated för välgörenhet. Chivas corporate, jobbat med community This is the life. Livstilsbaserad och skapat runt målgruppssegmenteringen av vilka som väljer Chivas och deras livsstil. Hemköpskampanjerna på Facebook, frågorna och kopplingen via kunskapsinhämtning och åsiktsinhämtning. H&M: big bang och grupper på Facebook. This entry was posted in Events on 2008 02 07 by Niclas (admin Researcher). Sitter in lite på seminariet medan Björn drar överblicken av web 2.0. Nu diskuteras sociala relationer och jämför mellan digitala/analoga relationer. Jag ler lite om det – jag ska köra igenom natives/immigrant. Nu om transparensen och det är intressant. Nu om var man syns. Var vill man synas? Det är onekligen fortfarande så att man inte inser att man måste vara engagerad. Nu JMWs undersökning om Facebook. This entry was posted in Events, Interactive on 2008 02 07 by Niclas (admin Researcher). Så var testet över. Själv valde jag att göra lite fest runt det – käkade en kebabtallrik och tittade och lyssnade på Björn, Mattias och Sture från Briggen Tre Kronor. Lite som det ska vara när det är första gången som man testar något så här nytt så är det tekniskt strul vilket gjorde ljudet försvann. Tyvärr eftersom jag kunde ana att Sture hade en hel del intressanta idéer och tänker man på Bambuser-teknikens möjligheter känns den klockren för just en sån sak som Briggen Tre Kronor-projektet. Björn Falkevik har sannerligen blivit en evangelist för olika möjligheter runt vloggande och mobil konvertering av sociala medier. Det som slog mig var ändå att det är så lätt att använda gamla (beprövade) sätt även om formatet är nytt. I det här fallet var att hela den interaktiva delen i början försvann genom att Björn och Mattias satt upp “studion” i form av en klassisk one-way-talk studio. Det innebar att interaktionen med chatten tappades bort en del. Det som hände var att chattens deltagare började diskutera saker som inte riktigt hängde ihop med vad som sades. Sedan är det helt enkelt viktigt att inse att de som är med i “rutan” inte kan hålla längre “monologer” eftersom det hela bygger på en konstant dialog mellan de som är med i själva rummet men också tillsammans med de som deltar i chatten. Hela onlinekonferenstestet kommer förhoppningsvis ut när Björn klippt färdigt från Snapz-filen (eftersom Bambuser ännu inte arkiverar inspelningar som görs via webcams). Och jag måste säga att – om han lär sig att använda sin röst bättre :) – så verkar Sture vara en man med många intressanta åsikter. This entry was posted in Events, Interactive on 2008 02 04 by Niclas (admin Researcher). Bland oss social media-nördar har den nya tjänsten Bambuser (än så länge i ett alpha-läge men transparent sådant) varit i fokus de senaste veckorna eftersom LidneInc:s producer Björn Falkevik idogt sänt realtidsmobilfilmer. Nu testar han, Östmar på PRfekt och Annika Lidne (Business by design och skapare av Disruptive Media-konferensen) att faktiskt skapa en mer ordnad diskussion men live. Helt enkelt att ta videobloggandet till en mer funktionell nivå. Grejen med Bambuser är dels att det går att se och höra personen live, med strömmande ljud och bild men också att interagera med honom eller henne via en IRC-kanal som går rakt in i displayen på den telefon som används för sändningen. Tyvärr kommer jag antagligen ha svårt att själv se det hela imorgon men eftersom allt arkiveras så ska jag med intresse kolla på det efteråt. Alltså: måndag den 4/2 mellan 11-13. Live med Östmar, Falkevik och Lidne. Gissningsvis diskussioner om sociala media, psykografisk mediestrategi och … sociala medier. Om någon vill vara med och kunna prata med dem via chatten utan att behöva vara “anonym” och kanske är intresserad av den nya svenska web2.0-idén kan få en invitation av mig. Jag har fem stycken. This entry was posted in Events, Interactive, Media, Online, Wireless on 2008 02 03 by Niclas (admin Researcher).